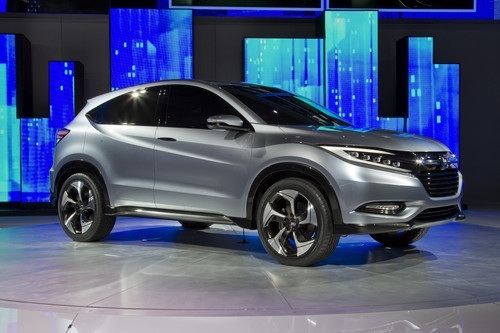 Honda revealed its “Urban SUV Concept” at the North American International Auto Show in Detroit to a large crowd. The new vehicle is a very important step back towards a small vehicle focus at Honda. Throughout the presentation by Honda executives the idea that Honda is unique in its ability to produce high quality, affordable, fun, fuel efficient vehicles was put forth. This is not much of an exaggeration. While there are companies that can create a vehicle that fits that description, Honda does create cars that fit that description. Honda always has. This new small SUV (SSUV?) will slot into Honda’s portfolio as a big sister to the Fit and a little sister to the wildly popular CRV. Honda’s conceptual spirit behind the new Urban Concept SUV is “man maximum, machine minimum.” This concept is not new to Honda and in this case it applies perfectly. At the launch, the concept of a “fun to drive spirit” was emphasized. Normally, we at Torque News are skeptical about the idea of “fun to drive” as it is often a substitute for “slow.” However, Honda learned a hard lesson recently with the CRZ, which was marketed this way, but was outright rejected in the marketplace since it could not get out of its own way, which is in fact not fun. It would not be like Honda to make the same mistake twice. Although details on the drivetrains were not released, one key element in the design is the Honda center mounted fuel tank. This location of the fuel is important because if the vehicle is configured as a hybrid, plug-in hybrid, or electric vehicle, the batteries will be at the lowest point in the vehicle and also at the center point in the vehicle. Thus, driving dynamics are optimized. Presently, the Honda Fit and its global market sibling, the City have this arrangement. In fact, the new Urban SUV will likely be built on the Fit platform, share much of its drivetrain and chassis with the fit, and is confirmed to be built on the same line as the Fit. The manufacturing location is Mexico, which Honda continued to try to insert as part of “North America.” For example in this quote by John Mendel, executive vice president of sales at American Honda; "With the continued expansion of our North American manufacturing operations, we expect fuel-efficient and fun-to-drive 'small' cars to play a key role in meeting the needs of our customers in the U.S." Of course Mexico is in the continent of North America, but for most buyers, if the vehicle isn’t built inside the borders of the USA, it may as well be imported from Mars. Sorry Honda, despite the NAFTA, buyers call “America” the 50 states, not Canada and certainly not Mexico. At 169 inches, the new Urban SUV is not that much smaller than many of the cars presently being sold in the CUV class. In fact, the Nissan Juke is 7 inches shorter. So this small SUV is not really that small. Designed as a 4-door coupe, as is most every new vehicle these days, the new Urban Concept hides the rear door handles, and makes the door gap invisible to make the vehicle look like a 2-door. In the Urban Concept, it works perfectly, in production, it will likely be more apparent the vehicle has 4 doors. The wheels on the concept are fabulous. The only problem with that is even the best drivers cannot help but scuff and scrape rims when the vehicle is actually used full time in the city. Honda would be wise to rethink the bling bling shoes. The only thing less attractive than steel wheels to a used car buyer are expensive alloys covered in curb-rash. Like all manufacturers, Honda has just had a very big burst in sales. During the the reveal of the new Urban Concept it was stated that Honda is predicting a rise from about 4 million vehicles globally now, to about 6 million, a 50% increase, in just 4 years. We will cover this topic of automakers thinking that only they can capitalize on a market bubble in a separate story, but generally speaking, if one is a sales manager and the company says 50% growth in 4 years it is time to update the resume. Honda’s new Urban SUV Concept will become a production model for the US in mid-2014. Torque News will bring you more details as they become available.